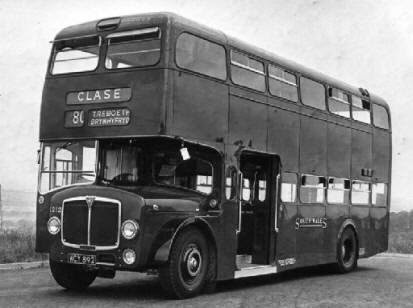 The current trend towards low-floor buses brings back memories of a similar trend in the 1950s and ‘60s, when manufacturers were seeking to reduce the height of buses. At that time it was the need to negotiate low bridges, rather than assist mobility impaired customers, which was the reason for the new designs. 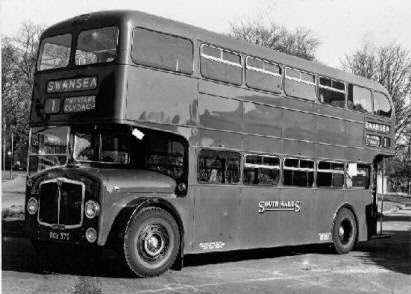 South Wales Transport had developed in the 1960s a strong policy of purchasing AEC vehicles. Indeed, Swansea’s hilly territory seemed an ideal testing ground for new vehicles and strange-liveried prototypes could often be seen in action in Swansea, working alongside SWT’s fleet. 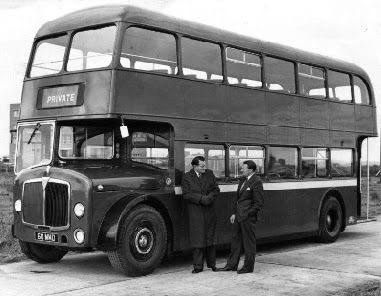 When, in 1956, AEC began to trial a new low-floor, low-height double decker – named the Bridgemaster – it was almost to be expected that SWT would take one on trial. Bridgemaster prototype and demonstrator 60 MMD. In fact, the third prototype, registered 60 MMD, was finished in SWT livery and, having toured other operators around the country, eventually was absorbed into the SWT fleet as number 1213. This unique vehicle had a Crossley body and many detail differences from the fleet of 22 ‘standard’ Bridgemasters which SWT subsequently purchased. The type became quite popular amongst enthusiasts, if not always drivers, and for those who lived on the Tycoch and Brynmill to Port Tennant to Grenfell Park services (33, 35, 75 and 76) the Bridgemasters were an everyday sight. They even strayed as far as Neath and Aberavon Beach on services which also required low-height vehicles because of low bridges at St. Thomas. Park Royal rear entrance example 1202. The side destination indicators were eventually panelled over. The first batch, numbered 1199-1207 were of the rear entrance design and were built in 1959. 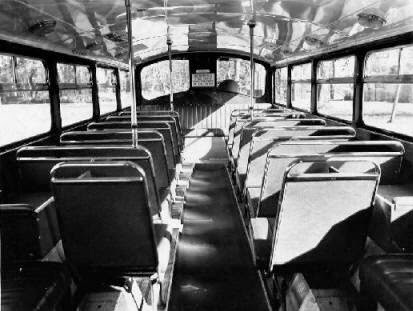 All previous ‘low bridge’ buses had consisted of a sunken upper deck gangway and bench seats in order to keep the vehicle height down. A green and cream interloper also appeared on the scene in 1959-60. This was 80 WMH, a further demonstrator and similar in layout to the earlier rear entrance vehicles. this is 1212 (WCY 892). Bridgemasters were of an integral design; chassisless and with front and rear running units arranged in a similar fashion to the London Routemasters which are still to be seen today. Air suspension produced some lively rides, especially over poor roads! The second batch of SWT Bridgemasters, built in 1960-61, were of a very square, front entrance design and entered the fleet as 1208-1221. 1214 had been exhibited at the Commercial Motor show and boasted, amongst other detail differences, fluorescent interior lighting – considered to be very advanced on a road vehicle in the early 1960s. Interior lower deck view of one of the SWT Park Royal rear entrance Bridgemasters. passengers always resisted sitting on these until the bus was absolutely full! The fleet spent most of its working life on the routes mentioned above, although towards the end of their careers some were transferred away from Swansea and numbered in the 872-880 series. Withdrawal came between 1969 and 1971 and thereafter the vehicles appeared with a number of dealers and other operators, notably a sister company to SWT, Yorkshire Woollen. Numbers 1204 and 1213 were later exported to the USA and may even still exist. 1209 and 1211 were exported to Canada, and reports indicate that they were eventually burnt out. Preserved 1959 AEC Bridgemaster/Park Royal H41/31R 1203 (UCY 837) at Swansea Bus Museum on 26th October 2014.